Pictured (L-R) are Callum Davidson, Belfast Royal Academy; Euan Morrow, Sullivan Upper; Lauren McCann, Dominican College Fortwilliam and Q Radio’s Simon Hunter. Ahead of the Danske Bank Schools’ Cup finals on Monday 19th March, three budding broadcasters won a unique competition with Q Radio and Danske Bank to ‘Be a Q Radio Sports Reporter for a Day’. 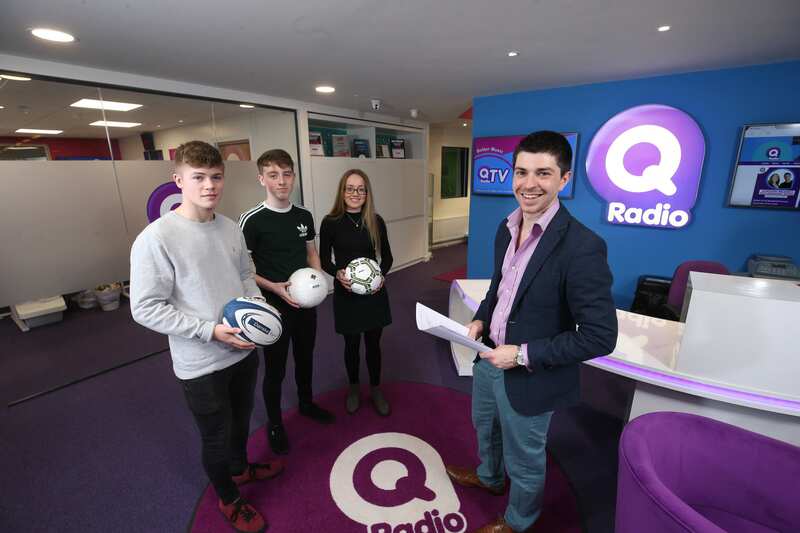 Lauren McCann (17) from Dominican College Fortwilliam, Euan Morrow (17) from Sullivan Upper and Callum Davidson (17) from Belfast Royal Academy recently spent the day with Q Radio Sports Presenter, Simon Hunter, who demonstrated the different elements of news and sports reporting. Each winner had the opportunity to record their own sports report and got to meet some of Q Radio’s top radio presenters.